KBP7-G in Providence saw a fight between a Hurricane battlecruiser fleet belonging to Providence Bloc and a mixed armor battleship fleet fielded by Siege Green. [SGGRN] and Lost Obsession [FATE]. The battle was fought over a Astrahus citadel deployed by the former. Providence Bloc had also fielded capital ships for the defense of the citadel. As the battle progressed a joint Did he say Jump [JMP-N] and Shadow Cartel [SHDWC] Sleipnir command ship fleet arrived as a third party to the conflict. Meildolf in Molden Heath saw a battle over an Azbel engineering complex between a Did he say Jump\Shadow Cartel Proteus strategic cruiser fleet and a Bangarang. [LOST.] and allies Machariel battleship fleet. 8/1 Pandemic Legion versus Brave Collective. DO6H-Q in Fade saw Pandemic Legion [-10.0] and Brave Collective [BRAVE]. The battle was fought over the latter’s Fortizar citadel, and saw Pandemic Legion bring a Typhoon battleship fleet while the defending Brave Collective fleet fielded Maelstrom battleships. 8/1 Escalating Entropy and Shadow Cartel versus Snuffed Out, Project.Mayhem. and The Initiative. Melmaniel in Verge Vendor saw a capital brawl unfold between Escalating Entropy [CHAOS], supported by Shadow Cartel and Snuffed Out [B B C]\Project.Mayhem. [16-13] later reinforced by The Initiative. [INIT.]. LR-2XT in Geminate saw a battle over a tackled dreadnought belonging to Hard Alliance [PYCB]. The fight saw a Therabois Tengu strategic cruiser fleet, with a Providence Bloc interceptor fleet and a Project.Mayhem. black ops battleship fleet battle an ever increasing kitchen sink fleet fielded by Hard Alliance. Another battle between the opposing sides in the Winter War unfolded in the 9KOE-A and SV5-8N systems in Catch. Stain Fraggin (SF) coalition fielded a Hurricane and Proteus fleets versus Stain Wagon (SW) coalition’s Gila cruiser fleet. 9/1 Drone Regions Federation and Pandemic Legion versus Project.Mayhem, Snuffed Out and WAFFLES. Oijanen in The Forge saw Project.Mayhem, together with Snuffed Out and WAFFLES. [N0MAD] attempt to mount a defense of a deploying Fortizar citadel against Drone Regions Federation (DRF) and Pandemic Legion forces. 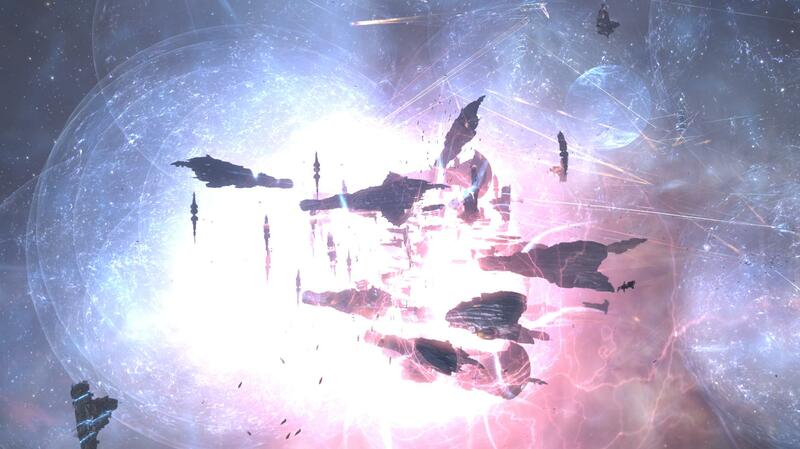 The defenders had 2 Proteus fleets, squaring off 2 DRF Machariel fleets and a Pandemic Legion Maelstrom fleet. CZK-ZQ in Catch saw Dangerous Voltage [DV] and Tactical Supremacy [TIKLE] mount a defense of a Fortizar citadel against an assault by Goonswarm Federation [CONDI] and SW. The two alliances brought a Rattlesnake battleship fleet, with SW bringing a Rattlesnake fleet of its own and Goonswarm Federation fielding a Proteus fleet. 36N-HZ in Catch saw a major battle over a tackled Test Alliance Please Ignore [TEST] titan. The fight saw Goonswarm Federation bring a Proteus fleet, as well as an entire super capital armada while SF forces fielded a Hurricane fleet, a Proteus fleet, a Cerberus heavy assault cruiser fleet and a Svipul tactical destroyer fleet. G-GRSZ in Perrigen Falls saw a desperate defense of a Sotiyo engineering complex carried by a Cerberus fleet belonging to Geminate coalition (GemCo) against an assault by a joint Shadow Cartel\Did he say Jump Proteus fleet. Kamela in The Bleak Lands saw Providence Bloc and Did he say Jump clash in a capital brawl. Providence Bloc had a capital roam celebrating Pentag Blade’s anniversary and came across the Did he say Jump fleet at a planet. The two sides proceeded to fight. Huola in The Bleak Lands saw a Did he say Jump\Shadow Cartel Rattlesnake fleet clash with a Machariel fleet belonging to Siege Green. and Lost Obsession. The two fleets fielded capitals leading to a costly brawl. I just want to say I am just very new to blogging and site-building and seriously savored you’re web page. More than likely I’m likely to bookmark your blog post . You certainly come with perfect stories. Many thanks for sharing with us your webpage. I have been exploring for a little for any high-quality articles or weblog posts on this kind of space . Exploring in Yahoo I at last stumbled upon this website. Reading this information So i am glad to exhibit that I have a very good uncanny feeling I found out just what I needed. I so much for sure will make sure to do not overlook this website and provides it a glance regularly. What are several of the most popular/best blog sites concerning cell phones and wireless tech? You’re so awesome! I do not think I’ve truly read through a single thing like that before. So great to discover somebody with genuine thoughts on this topic. Seriously.. many thanks for starting this up. This website is something that’s needed on the internet, someone with some originality! I require to make a little extra money as well as I am an extremely opinionated person so I feel like creating blog sites would be a good beginning to making some additional cash. I am a full-time college student as well as I additionally have a $20 hr a week job however I am still having troubles making ends fulfill. Many thanks for any type of assistance!.